The alarm goes off but I've already been sleeping light in anticipation. It's just after 3 in the morning and I have a flight out of Stockholm at 6. I change into my leggings, as I'm slept partially in my outfit and climb down from the bunk bed. Luckily, I have everything almost packed, as I knew last night that it wouldn't get done in the morning. Brushing my teeth and gathering my things, I set off to the express train that will get me to the airport. In the hostel lobby, there's one staff member awake jamming out by himself, and he lets me weigh my bag on the vintage scale. Just over 5 kilos--which is miraculous for how stuffed my bag is. However I've found the best way to fly without checking luggage and on budget airlines is to load up your 'personal item.' So to take advantage of this my purse, camera, and toiletries all go in a large tote bag and only my clothes and a few basics are in my backpack. After a ten minute walk to the train station, I find that the doors are locked. Lovely. A passerby stops and helps me, leading me down half a block to doors that open. After climbing down a flight of stairs I pop out on the platform. That's when I realize that the other doors were locked for a reason--they lead to the correct platform, that of the express train, which is not yet running. I wait for ten minutes, graced with free wifi, so I can check and I see that the trains start running at 4:30, so I should still be on time for my flight. I eat a banana I bought the night before. I think I hear someone on the opposite platform, so I climb down and walk across the tracks to the next, which is one over from the express train. But I dare not go one farther as the platform is taller there and I don't think I could pull myself up. Finally, there's a technician on the other platform who confirms that the train will run at 4:30. I decide to go up to the street again as that's the only easy way to the right train. There I find a couple waiting for the doors to open, which they do at 4:05. I find a seat on the train and try to doze for a few minutes. Next thing I know we're at the airport and it's busier than expected, so I work my way through security with a bit of a nervous knot in my stomach. I'm fine, walking fast to the gate, and arriving with enough time to go and buy a croissant while a very nice Swedish couple keeps an eye on my backpack. We board and the flight is simple, I manage a 30 minute nap and two cups of coffee. In Dubrovnik ahead of schedule, I stop at an ATM and buy a bus ticket into the city. The hostel I was to be staying at had given loose directions. My nose pressed to the window, I saw the city gleaming pale gold and orange on a deep turquoise colored ocean. In town, I walked around the bus station for five minutes before finding the central local stop and buying a ticket from a 'tisak' or newspaper stand. After 20 minutes of waiting for either of two buses that would take me right by the hostel, I gave up and jumped on the next one that came. Using my offline map app, (I highly recommend it for all travelers), I got off at what I thought was the closest stop. Looking at my map I thought it would probably take ten minutes. More towards 30 minutes later, at 10:30 and in 90 degree (F) heat I stumble up the last flight of stairs and into the hostel. Dropping off my bags, I set off towards town, along a busy road. I decide-in my infinite wisdom-to forgo the route given to me by the hostel reception and go down an alley staircase. Thirty minutes later and sticky with sweat (probably a little delirious from the sun too) I'm in the old town, which is packed with tourists. Luckily, I start to take some turns off marble streets of the main boulevard. Soon I'm completely lost in a maze of tiny stone houses and clothes lines. I was on the side of town closer to the sea, where there are less restaurants and the alleys make a maze. 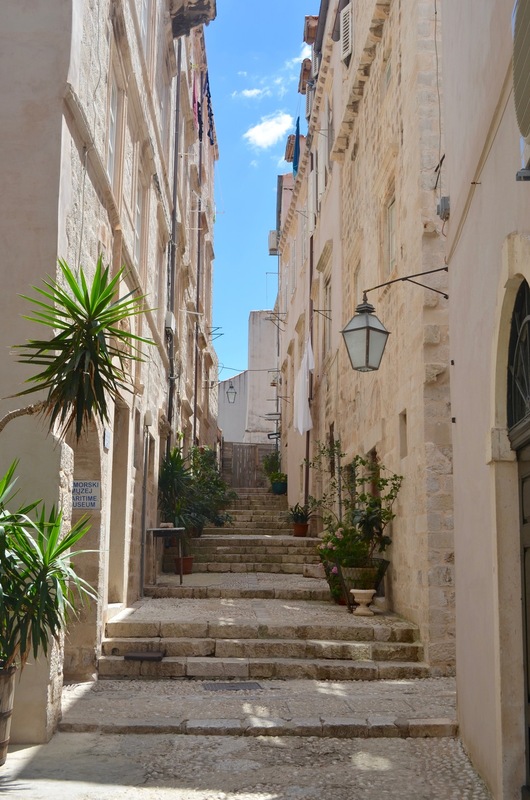 This is where I found my true taste of Dubrovnik, my fingers slipping over cool, golden walls, my eyes catching in the tangles of window box flowers. 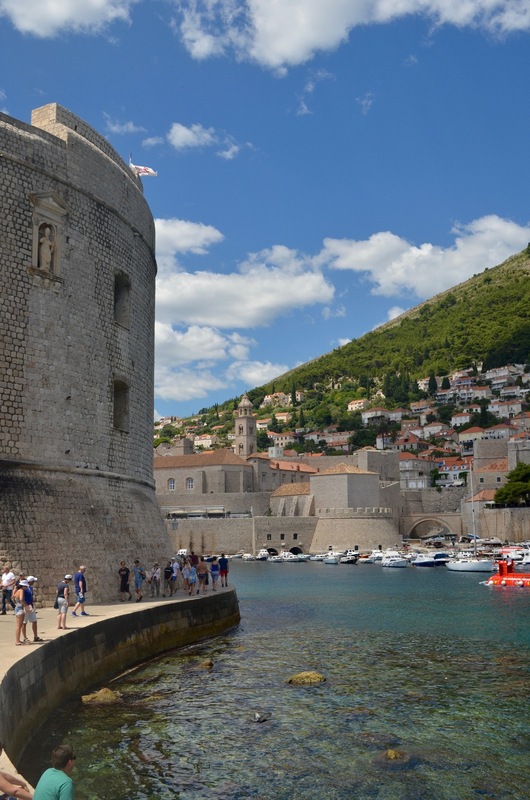 Then walking around the outside edge of the wall, bordering the Adriatic, licking an ice cream cone and dreaming of sailing deep into the forever blue of the water. This went on for hours, until I took the walk back to the hostel to check in to my room and avoid the heat. An hour of travel planning (I've only been making plans a few days in advance of where I am at the time) later and I set off back to old town once again. Next I scoped out a 'fast food' place called Barba, that served me a delicious shrimp burger. Feeling full and spurred to creativity by some street musicians, I found a good step to sit on near the gate to the port and pulled out my sketchbook (keep an eye out for a picture to come). 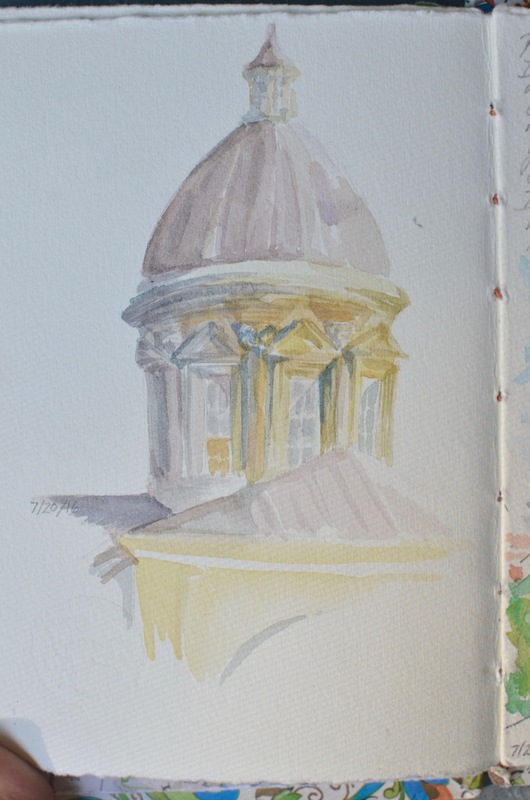 Using my miniature watercolor set, I sketched the dome of Dubrovnik cathedral across from me before laying in the colors that the setting sun was casting it's way. Nearly an hour later, racing the sun for light, I let the painting dry and try to gather up my things. Still a slightly removed from the real world, I drift through the crowds on the Main Street without much purpose, heading vaguely towards the new city and my hostel. Climbing stairs upon stairs I am treated to the wall and the city alight while I catch my breath. Then I begin the walk back. Some thirty minutes later I realize that I am either too deep in my thoughts or simply exhausted and have passed my hostel, so swinging around I head back, planning to go straight to bed. Upon arrival and a quick shower, a few people are moving into the room and we begin chatting. Even when I'm laying in bed, I'm eager to make friends, but at some point I stopped mumbling responses and fell very asleep.